William E. Simpson II posits that the USA’s Wildfire epidemic is the result of serious ecological imbalances that are enhanced by a warming climate cycle, and the re-introduction of seriously depleted herbivore populations can make a big difference. The nature and characteristics of wildfires in America have changed dramatically over the past decades as a result of several factors including a warmer climate cycle. 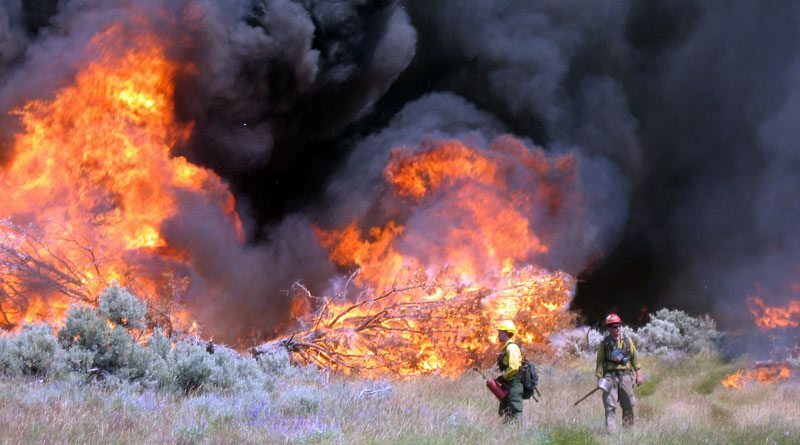 Excessive amounts of ground fuels (grasses and brush), which act as the kindling needed to ignite other forest debris such as dead and dying timber and previous fire-damaged trees have accumulated in and around most forests and present a new risk. This fundamental problem is a direct result of large declines in the populations of large herbivores (cervids: deer, elk, moose and caribou) that historically had controlled these grasses and brush via their ubiquitous grazing. By reducing these now prodigious super-hot burning ground fuels back to previous normal levels, the frequency and severity of wildfires would be much different, resulting in a more normal fire-cycle. What has been long overlooked is that grasses and brush burn as hot (sometimes hotter) that trees according to research. 1. Over the past 40 years, large herbivores such as deer, elk, moose and caribou in North America have seen significant drops in their populations from historic norms. For instance in California, the deer population has steeply declined from over 2 million deer to just about 350,000 deer in 2016 according to DeerFriendly.com. The populations of deer, elk and other herbivores have suffered significant declines in many areas as a result of several factors, including but not limited to disproportionately high predator populations, disease, poor hunting management policies and vehicular incidents, as well as losses via wildfires. The problem is the ecosystem is out of balance; for instance: On average a single black-tail deer will consume about 7 pounds of grasses and brush daily. Considering the deer population depletion in CA of about 2 million deer (net loss) over past few decades, the loss in ground fuel abatement (grasses and brush) in and around forests amounts to about 18 million pounds of fuel per day (grasses/brush). That is about 18 million pounds in a day in and around CA forests, which annualized is 3 million tons of grass and brush that is no longer being abated by natural means, just in CA. 3. The massive and growing annual deforestation of America by highly-fueled super-hot wildfires, now known as megafires (defined as 100,000 acres or more in size), presents as a grave threat to America’s core natural resources and extends well beyond the loss of forests and trees. These megafires are also a threat to the national security of the United States of America, since they pose significant economic threats and also threaten critical infrastructure (roads, bridges, power transmission lines, communications, etc). Recently, the US Coast Guard had to shut down vessel traffic on the Columbia River due to wildfire. 4. The health, lives and property of Americans are now under grave threat from wildfires. Thousands of homes and structures have been gutted and hundreds of lives taken by wildfire annually. A National Institute of Heath study ‘Non-Accidental Health Impacts of Wildfire Smoke’ said; “Wildfires take a heavy toll on human health worldwide”. Thousands of Americans across the country who have been subjected to long-term wildfire smoke inhalation are falling ill, some requiring urgent medical care. “People are getting sick. That’s the whole long and short of it,” said Sarah Coefield, an air quality specialist at the Missoula City-County Health Department in western Montana. Wildfire smoke is especially dangerous to people with chronic heart and lung problems, said Julie Fox, an environmental epidemiologist with the Washington State Department of Health. 5. Populations of wildlife and habitat are being wiped out by wildfires as millions of animals ranging from frogs to elk are vaporized. Watersheds and fisheries are also being devastated and ground water stores and surface waters are adversely affected as well. 6. According to the National Interagency Fire Center, American forests were being devastated at the average rate of 5.7 million acres per year, for the past ten years (2006-2016). In 2017 alone, we have already lost 8.5 million acres. 9. There is abundant evidence to support the position that when any forest project posits vegetative management in forests as a pretense for a logging operation, salvage or otherwise, litigation is likely to ensue, and in addition to NEPA, the USFS uses the Property Clause to address any potential removal of ‘forest products’. Nevertheless, the USFS currently spends more than 50% of its total budget on wildfire suppression alone; about $1.8 billion annually, while there is scant spending for wildfire prevention. 10. The implementation of vegetative abatement of exclusively grasses and brush by large herbivores (wild horses) would be consistent with managing the ecosystem in and around selected forests in a manner consistent with a naturally operating ecosystem, where reintroduced native wild horses could pick up the grazing slack created by absent or depleted deer and elk. In post-burned forest areas, this methodology may be extremely effective in limiting re-burns. We have observed serious re-burns in many locales: I.E. Kalmopsis Wilderness ‘Biscuit Fire 2002’ – same area re-burned due to excessive grasses and brush in ‘2017 as the Chetco Bar Fire’. Six Rivers National forest burned in 2014, re-burned in 2017 due to excess ground fuels. Cattle are not well-suited for ‘fire grazing’ for several reasons, including but not limited to; (i) they are ruminants with multiple stomachs and tend to deplete native pastures since they digest most of the plant and grass seeds they consume, and therefore do not reseed the pastures they graze; and, (ii) their evolutionary hoof design that incorporates two claws has a serious impact on range land and riparian areas. Unlike cattle, wild horses that coevolved here in North America with cervids as commensals, have a single stomach and are incomplete digesters and therefore pass most plant and grass seeds they eat intact (viable) back out onto the soils in the ecosystem where they graze, thus reseeding the pastures they graze. This combined with their soil-building humus-rich manure helps to restore fire damaged soils and quickly reestablish the native plants and grasses needed to control post-fire erosion. Cattle cannot accomplish this. Another positive evolutionary feature of North American wild horses is that their hoof design is unique and is essentially circular and concave on the underside which traps moist soils under the horse’s hoof (Fig. 1), and this combined with a relatively large surface area distributes the weight of the horse evenly and with lower ground loading (pounds per square inch) than cattle, as we see in the following images. The bovine hoof has two pointed claws and penetrates deeply into the same soil as photo above. On the other hand, cattle have an evolutionary cloven hoof design that includes two pointed claws that provided an adaptive advantage in Africa where they evolved. The relatively low surface area on the underside of the hoof subjects soils to much greater force loading (pounds per square inch is higher) since the weight is applied to the ground via a much smaller surface area. This increased ground loading by cattle hooves significantly damages and disrupts soils, thereby increasing the effects of erosion by rains in areas defoliated by fires, and creates excessive turbidity in streams and rivers thereby adversely affecting the watershed. This evolutionarily evolved cloven hoof design arguably provided added traction in and around riparian areas where cattle prefer to homestead as they evolved in Africa. 1. The current and future disposition of the free-roaming native American wild horses that have been removed from herd management areas (HMAs) and are currently being warehoused by BLM in corrals costing $70-million/year must be addressed. Any effort to dispose of these treasured wild horses via slaughter or euthanasia would result in a political firestorm and extensive litigation by horse and burro advocates. Deploying the native species wild horses for fire abatement is optimal from both a political and economic standpoint, since each horse will abate 30-lbs. of grass and brush daily and due to their unique gastric systems, most seeds they consume are redeposited into the soil intact via their droppings, which rebuilds damaged soils. Fifty thousand wild horses allocated in and around selected forests would abate approximately 1.2-million pounds of ground fuels daily, which using any other abatement methodology would cost tens of millions of dollars annually. Horses don’t drip fuel or make sparks as they continue to abate even dry grasses and brush during the heat of summer. Below is a video of wild horses consuming dry native grasses and brush. 2. The current and ongoing serious population declines in deer and elk (and other cervids) across America, which is to some extent attributable to disease (chronic wasting disease: ‘CWD’) and excessive predation by disproportionately and abnormally large populations of predators, primarily mountain lions and coyotes is naturally mitigated by this plan. The re-introduction of wild horses into carefully selected areas in and around forests addresses two aspects of the decline in cervids; a) Horses are immune to the deadly prion disease (Chronic Wasting Disease) that is vectored into deer and elk via grasses and brush; and, b) wild horses would absorb some of the predator pressure on deer and elk byapex predators (a natural evolutionary event in a balanced North American ecosystem), thus allowing some relief for declining deer and elk populations in the United States. This aspect of the plan is a big plus for the $10 billion/year. US hunting industry. 3. The redisposition of the corralled wild horses provides an exigent cost-effective pilot solution that embodies an all-natural alternative pre-fire management/prevention methodology that can used alone or integrated with other mechanized pre-fire management methods in some areas to save American forests and watersheds, and would; (i) alleviate the costs of holding the horses; (ii) sidestep the potential political firestorm if these horses were to be killed; and (iii) help limit ‘fire-borrowing’ in the USFS budget. There is zero doubt that these horses would reduce fuel-loading in and around forests at risk once deployed. They evolved as a North American species alongside deer, elk and other cervids doing that job. 4. Authority for the Secretary’s (DOI and/or USDA) implementation of any emergency measure(s), which may include using WHFB to protect forests, may already reside under existing law including but not limited to; 16 U.S. Code § 551 – Protection of national forests; and/or 16 U.S. Code § 594 – Protection of timber owned by United States from fire; and/or 43 CFR46.205 – Actions categorically excluded from further NEPA review. However this plan could be enacted via administrative action between federal agencies of the USFS and BLM, legislative action by Congress, or by Executive Order. 5. The Scharader-Simpson Wildfire Disaster Funding Act (a bill) currently cites allocating additional funding for mechanized pre-fire management to abate excess fuels in and around forests and for fire-attack. Even though the WHFB initiative could mitigate wildfire to some extent as a ‘stand-alone’ program, it could also add an environmentally-friendly and cost-effective dimension to the Scharader-Simpson bill, or provide the basis for a new bill. Wild horses would abate fuel-loading in and around selected forests (including those recently burned which become at-risk for re-burn once grasses and brush reestablish (i.e. Six Rivers/Klamath National Forest and Kalmiopsis Wilderness Forest) and would perform this service year-round. Wild horses can safely abate excess fuels (grass-brush) even in fragile or difficult-terrain forest ecosystems not suited to any mechanized methods. As we see in many European forests, including the royal forests in Sweden and Norway, horses are used in forest management because they don’t have an adverse impact on the forest floor. Yes, wild horses would be the perfect wildfire preventers!